A local community group is hoping to put a B.C. Arts Council grant to good use come 2015. 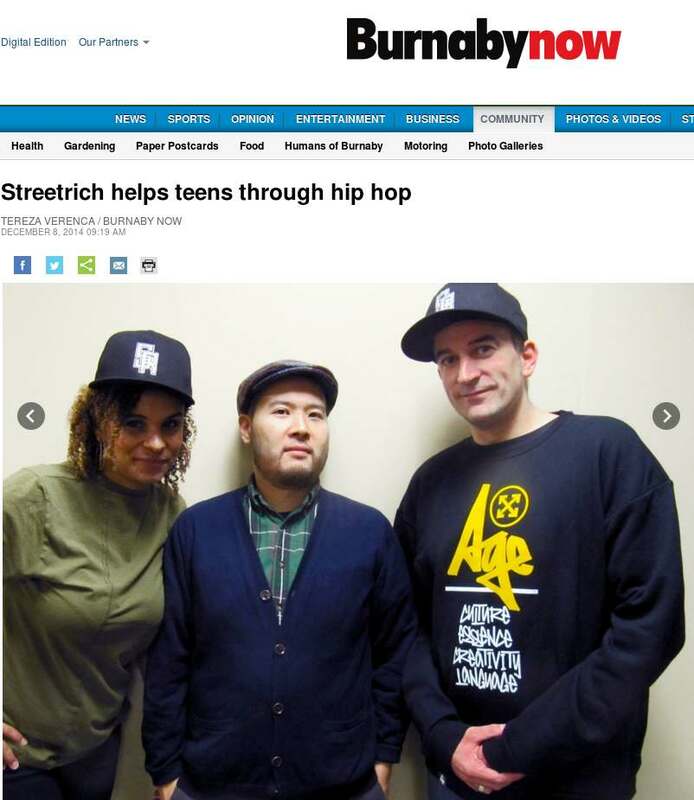 Streetrich has been around for the last two years, providing free drop-in lessons to youth who do not have the means to take structured classes (everything from break dancing to creative writing). The end goal is to help them discover their own voice through the hip hop platform. The grant money will help fund Safe Cyphers – a series of four workshops to be held every Sunday during February, also known as Black History Month. Kadiri, a rapper herself, added another important component of the sessions is discussion around using proper terminology in conversations with teens. The curriculum will cover other topics, including delving into hip hop’s history. From a cultural perspective, a few hours will be devoted to looking at different genres of music, including funk and jazz. “Specifically, how it ties into the music industry today, how artists of colour are represented in mainstream media and how to have these conversations without alienating people,” she said. The workshops will also involve a lot of self-reflection, asking participants to think about their coping mechanisms when confronted with serious issues. “How do you navigate through that? You can’t bring your own politics into the room, and I think that’s a divide we have with some facilitators,” said Kadiri. All in all, it’s about going back to hip hop’s roots, understanding how it is represented in the present day and being able to communicate that to youth. “It gets adopted by all these organizations who try to make it cool, but don’t go into the deeper issues that come from the culture,” she went on to say. A venue for the free workshops has yet to be announced. Registration will be required because space is limited. For more information, visit streetrich.ca. There were two other B.C. Arts Council grant recipients from Burnaby – the Nikkei National Museum ($15,000) and Russell Sholberg ($1,750).